It all began when Jacob Ora was just ten years old. The pain he felt throughout his whole body severely limited his mobility and has made daily life a struggle. But since joining the PWS&D supported Tidzalerana Club in Malawi, Jacob, now 49 years old, has experienced profound changes in his life. “I thank God for the support I received from Tidzalerana. I feel love when I consider what the club has done for me,” shares a grateful Jacob. Tidzalerana means ‘we care for one another.’ Led by dedicated volunteers, the club works to provide people who have physical and developmental disabilities with nutritious meals, practical skills and a safe place where they feel loved and accepted. Jacob Ora on the wheel chair he received through the Tidzalerana Club. 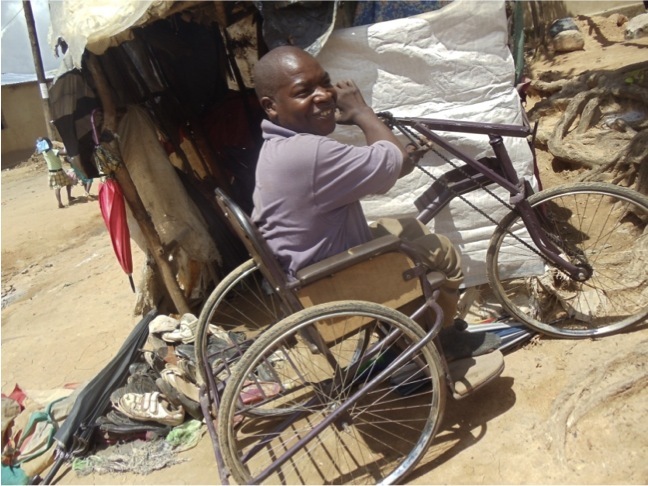 To help improve Jacob’s quality of life and give him more autonomy, the Tidzalerana Club provided him with a wheel chair. Jacob has also benefitted from the skills training offered by Tidzalerana. Determined to build a better life for his seven children, Jacob hopes to use the tailoring and tinsmith skills he acquired to start a small business. “I still struggle to provide for my family. Sometimes we eat once or twice a day. But I try as much as possible to provide for my children’s education.” Currently he works repairing shoes and umbrellas in order to save up for a sewing machine. Help provide vulnerable people like Jacob with loving support and skills training in order to overcome challenges and create brighter futures for themselves and their families. A gift of $200 buys one participant a wheelchair.